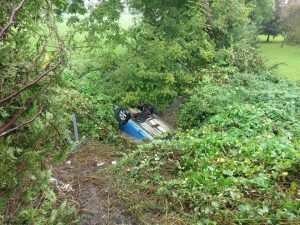 A KILMEADEN man who waded into a dyke to rescue a drowning elderly driver from an overturned car will be honoured on Friday at the National Bravery Awards in Dublin. Kelvin Kearns of Tigroe, Kilmeaden, Co. Waterford is receiving a Certificate of Bravery for his actions on 27 September 2017. He was driving in heavy rain and wind at Holycross in Butlerstown when he saw signs of an accident, including a flattened roadside fence. He ran across the road to discover a car upside down in the dyke below. He waded waist-deep into the water, opened a passenger door, reached in and caught hold of the man, pulling him free and holding him above the water line until paramedics arrived. The man he rescued spent weeks in hospital but recovered. Mr Kearns is among 21 people being honoured at Friday’s ceremony at Farmleigh House in the Phoenix Park, Dublin. The annual awards since 1947 have been administered by Comhairle na Mire Gaile – the Deeds of Bravery Council – which is chaired by Ceann Comhairle Seán Ó Fearghaíl TD. The Deeds of Bravery Council includes the Cathaoirleach of Seanad Éireann, the Lord Mayors of Dublin and Cork, the Garda Commissioner, the President of the Association of City and County Councils and the Chair of the Irish Red Cross. Kelvin waded into the dyke to rescue a man from the overturned car.